I'm a big bath person and I believe there's a bath for nearly every life situation. If you're feeling a little sluggish, are getting over something, want to reduce inflammation, or you want to maintain your body's great health, this detox bath recipe is great. This treatment will also help to shine up your skin and scalp while pulling stored toxins from your body. (Yes, you'll need to dunk your head for the scalp treatment.) Because of the detoxifying nature of this particular treatment, you'll want to drink water during your soak, but more on that below. I hope you enjoy this invigorating bath treatment. 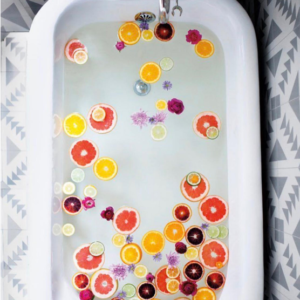 Soak in bath water for a minimum of 20 minutes and up to 40 minutes to allow your body to absorb the salt, baking soda, vinegar, tea, herbs, and citrus. Drink Citrus or Cucumber Water while soaking in this Detox bath; this treatment pulls toxins out of your body so you'll want to hydrate during the treatment. You may notice that you sweat during this treatment, it's completely natural as sweating is one of your body's natural detoxifying systems. After your bath, continue drinking water to hydrate your body and try to rest for at least 30 minutes. This bath treatment is great before bed or when you have a gentle day of rest and relaxation planned. This detox treatment isn't a great choice for right before work or before running errands.